The Pentagon’s F-35 fighter jet program, the most expensive program to date, is expected to jump by at least $27 billion in costs, Bloomberg reported. The total acquisition cost for the Lockheed Martin-made F-35 is predicted to spike about 7 percent to at least $406.5 billion, according to a draft of the Selected Acquisition Report, to be submitted to Congress this week. The uptick follows several years of declining estimates. The report expected the current cost of $379 billion from a previous high of $398.5 billion in early 2014. F-35 program spokesman Joe DellaVedova didn’t immediately respond to Bloomberg on the cost estimate increase. The Joint Strike Fighter program office typically waits until the report is formally released to Congress before commenting. Delayed testing could be one reason for the increase. 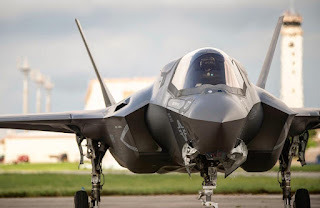 The Government Accountability Office (GAO) in April released a report that said “cascading F-35 testing delays” could add more than $1 billion to the cost of the program. I'm just gonna leave this right here....and wonder how many more Super Hornets the Navy is gonna buy after they see this PENTAGON REPORT (not from the GAO but the freaking Pentagon!) and see the cost creep on the F-35C. Can anyone say TRUNCATED BUY??? ?